I'm making a new topic for Warhammer 40k as 8th Edition is coming out in June. It's going to be a really big change, so I figure it's kind of like getting a new game in a video game series and is worthy of its own thread. If you’re not familiar with Warhammer 40,000, it’s a tabletop miniatures wargame. Basically that means you’re taking turns pushing around toy soldiers on a table and rolling dice. It’s kind of like plastic army men for “grownups”, in the same way that Dungeons & Dragons is basically playing make believe. There’s also a major hobby element to Warhammer. The toy soldiers are small, detailed models that people put a lot of time and creativity into assembling and painting. Additionally a lot of work goes into making terrain to play on. I imagine it’s quite a bit like model trains, except it’s homicidal space men. Warhammer isn’t for everyone, but if you’re into at least two of the three aspects (the game, modeling/painting, the story) it is a heck of a lot of fun. The new edition is going to be a pretty radical departure. The 3rd Edition of the game came out in the late ‘90s, and editions 4-7 were just small changes to the same basic rules. The new edition is going to make a lot of big changes. The core rules are going to be free, and only 14 pages long. All existing faction-specific rulebooks are now invalidated, but they’re going to have low-cost books available on launch to get us by. Units will get their own special rules in their data sheet, rather than having to constantly refer back to the main rulebook. Points for everything will be in a separate book, so that the game balance can be fixed on a regular basis without invalidating all the existing books. I’m super excited. I haven’t played 40k for about ten years as I didn’t feel I had the time or the space. I started to get back into it this year. I've bought more models in the last five months than in the entire ~7 years that I played previously. The amount of stuff we could do compared to 3rd/4th (when I used to play) was really cool, but the amount of rules had also become pretty crazy. There were also a lot of loopholes for people to pull some shenanigans, and some seriously unbalanced point costs, and it sounds like Games Workshop is fixing that with the new edition. They are also releasing a new line of Space Marines and Death Guard, which will be in the new starter set. The models look cool. I have mixed feelings about the new Marines, but I’m still waiting on new information. quazi wrote: I imagine it’s quite a bit like model trains, except it’s homicidal space men. Never got into 40k, but sounds fun, Hope you enjoy it! SCBrian wrote: Never got into 40k, but sounds fun, Hope you enjoy it! From what they're saying between simplifying the rules and making them cheap/free 8th edition is going to be a really good time to get into it. I'd still say it is one of those "try before you buy" things, when possible. Most game stores have a 40k night, and if you show up there's probably someone who will let you use one of their armies and show you the ropes. This is nice because not only does it not involve a big investment of time and money, but it also lets you check out the store and the people. Like most real life, face-to-face games the people that you play with make a huge difference. Good people can make a bad game fun. Bad people can ruin a good game. I used to play mostly with my brother. With the rules being free/cheap, if a person was just going to play with friends and family they could try the game out by playing with paper cutouts, tokens, or other "stand-ins" for models before spending much money. The Dawn of War video games are also a decent introduction to the universe. There are quite a few people out there that just paint the models and read the books, and never play the game. There are some people who love the game but hate painting, so they just rattle can and wash their models (or pay someone else to paint them). It has something to offer to a lot of people, but it's definitely not everyone's cup of tea. I happen to like the game, the story and putting together the models. I played DoW. I remember that game. Cool. Remember, when going over-the-top, use jump jets! MPMalloy wrote: I played DoW. I remember that game. Cool. Remember, when going over-the-top, use jump jets! They just came out with DoW 3 a little bit ago. It's supposed to be more like the first Dawn of War. I haven't played it yet though. Also, the new type of Space Marines they're releasing has a jump pack variant. Looks like it will be more like Adepta Sororitas Seraphim squads than a normal Space Marine Assault Squad. They haven't released the rules for it yet. I don't like these models as much as the regular Primaris Marines (that's what they're calling the new Space Marines) but I've seen some photoshops of them in Black Templar and Salamander colors and they look a little better. Wow, really surprised GW is making anything free. GW always seems like they are in the "Search for More Money". The setting was/is really cool, but I know a lot of people who got tired of them constantly tweaking rules or nerfing a faction simply because it seemed like they wanted to up the sales of another faction. Looks like the changes you mentioned might bring them into modern times and align themselves more with other modern miniature strategy games. Hoping they work on keeping things better balanced between factions. If you are into miniature strategy/war games with a fantasy or sci-fi flare, may I also suggest Hordes/Warmachine (WarmaHordes) by Privateer Press? A standard game/battle typically has a lower point cost and, therefore, smaller number of figures than Warhammer or WH 40K. A lot of my friends have played it and really enjoyed it. Ellywick wrote: Wow, really surprised GW is making anything free. GW always seems like they are in the "Search for More Money". From what I've heard they got rid of their former CEO and the new guy is doing a lot more in regards to community engagement, game balance and making the game more accessible to new players. The old CEO had a quote along the lines of 'we are a miniatures company, not a game company' and a reputation for putting selling models before anything else. The thing is that players can only be pushed so far in terms of poorly balanced and unclear rules before they stop playing (and therefore stop buying models), and apparently GW's sales were going way down before the new guy took over. From what I've read I missed the worst of it during my long hiatus. Ellywick wrote: If you are into miniature strategy/war games with a fantasy or sci-fi flare, may I also suggest Hordes/Warmachine (WarmaHordes) by Privateer Press? A standard game/battle typically has a lower point cost and, therefore, smaller number of figures than Warhammer or WH 40K. A lot of my friends have played it and really enjoyed it. I've seen people playing it but I haven't tried it myself. I'll have to see if the local store has a night where people play Warmachine. The Jacks look pretty cool. I'm also excited for a Fallout miniatures game that Mophidius is going to be coming out with. Even if the game is rubbish as long as the miniatures are good I could use the for a pen & paper Fallout RPG. Recently got back into W40K. When I heard 8e was coming out I stopped buying. Mostly I've been playing Shadow Wars. They also posted about new Death Guard models. I've got the Shadow Wars book, but I'm not very far into it because I hate reading rules. It looks fun, though, and hopefuly I'll be able to force myself through the dull part (reading rules) so I can get to the fun parts (list building, modeling and playing). There are a lot of people playing it at the shop nearest to me. The Death Guard models look pretty cool. I like that the plague zombies look so happy, and the lab coat and hazmat gear are nice touches. They might look a little cartoony for my tastes, but it's hard to judge just from the pictures that have been posted. Often I don't like the pictures GW takes, but then when I see the model in real life I like it a lot. They released some of the rules for the new jump pack Primaris Marines. They get +1 Attack and +1 Wound base, like all Primaris Marines, but they also get +1 Toughness from their armor, and their weapons are a pair of 18" Heavy Bolters. They also have jump packs, of course. Stand up and strike them down! Those painted pieces are great. I wish I was that artistic. Yeah, the dialogue in DoW could be pretty funny. I figure I'll probably end up listening to all the DoW 3 dialogue on Youtube before I actually get around to playing the game. There was a 40k spaceship game called Battlefleet Gothic. They made a computer version a while back that's on Steam, but I've heard mixed reviews so I'm waiting for it to go on sale. There are some crazy good painters out there. I'm so out of practice I'm sure the stuff I paint is going to look pretty bad. I'm waiting for it to warm up a bit so I can prime with rattlecans. 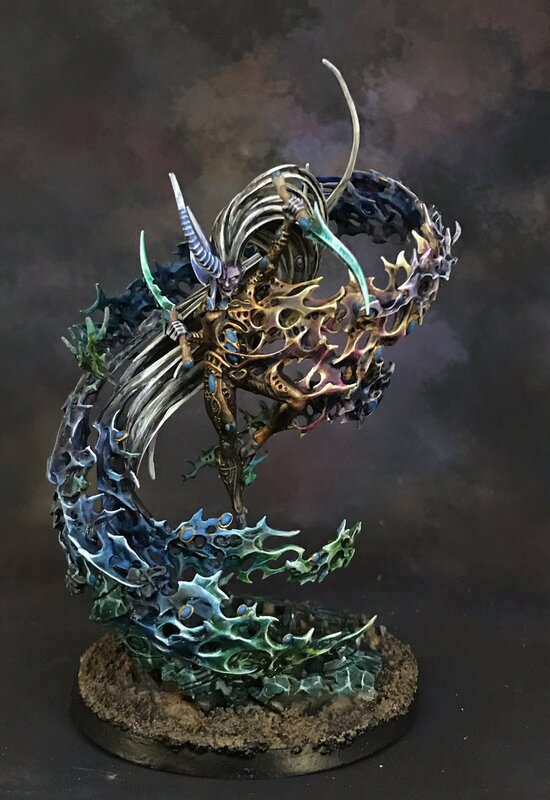 I saw a picture yesterday of an Eldar Yncarne (Avatar of the Eldar god of death) that was really good. ETA: Apparently the model in the picture I linked above is still a work in progress. It looks pretty good to me. So it sounds like the data sheets for individual units won't be free. The books are going to be a lot cheaper than before. For instance, I'm picking up the Xenos II index which covers Orks, Tau, and Tyranids/Genestealer Cults for $25 where as previously if was a ~$50 book for each. I'm sure they'll come out with more specific books later on, but I'm guessing this will be like the Age of Sigmar Compendiums and they won't necessarily be invalidated by the new books. Still, it's a bummer because if they were to include the rules for free if some person picked up just a single box in a store they would be able to play a small, fun game with it without having to buy a book. That would be a way better way to get people into Warhammer. Hopefully they'll actually include the unit rules for free in each box, even if they aren't available online as a free download like for Age of Sigmar. Images taken from the Warhammer Fest live blog. The Kharadron Overlords are basically steam punk dwarven sky pirates! quazi wrote: So it sounds like the data sheets for individual units won't be free. The books are going to be a lot cheaper than before. For instance, I'm picking up the Xenos II index which covers Orks, Tau, and Tyranids/Genestealer Cults for $25 where as previously if was a ~$50 book for each. I'm sure they'll come out with more specific books later on, but I'm guessing this will be like the Age of Sigmar Compendiums and they won't necessarily be invalidated by the new books. Art. Straight-up art. God, that is amazing! MPMalloy wrote: Art. Straight-up art. God, that is amazing! Yeah, it's really good. I wish I were that talented. I'm probably going to try painting something tomorrow. It's too cold for spray paint primer, so I'll probably just do a couple models that have already been primed rather than trying to batch-paint anything. I'll try to remember to. I've done a tiny bit of painting, but it was mostly just hastily priming and slapping base layers onto stuff so they wouldn't look too horrible. They're nothing I'd want to show off yet, though. Been pretty busy frantically trying to get plants into the ground. I did get to play one game of 8th Edition, and it was pretty fun. Ork Boyz hit dang hard. I don't know if anyone has seen the boardroom suggestions memes, but this one made me unreasonably happy. Do they still have the rule for Orks that if it's red, it goes faster? I never played a lot of the game directly (did more watching than playing- see table-flipping Nerd Rage as mentioned above), but that was my favorite rule in the entire game Plus, it convinced people playing Orks to try and paint their armies. On one hand, it would be cool for one of these types of games to institute perks for painted models, on the other hand, sometimes that ends up being a money game for those who are too busy/don't have the skill to paint their own minis. Ellywick wrote: Do they still have the rule for Orks that if it's red, it goes faster? I never played a lot of the game directly (did more watching than playing- see table-flipping Nerd Rage as mentioned above), but that was my favorite rule in the entire game Plus, it convinced people playing Orks to try and paint their armies. On one hand, it would be cool for one of these types of games to institute perks for painted models, on the other hand, sometimes that ends up being a money game for those who are too busy/don't have the skill to paint their own minis. That was a really fun rule. It was in 3rd Edition through 7th Edition (possibly it was in 2nd Ed and Rogue Trader, but I didn't start playing until 3rd). Unfortunately it is not currently in 8th Edition rules. However, we don't really have an Ork book yet, so I'm pretty sure they'll add it back. They released a bunch of "indexes" to get people by until they could come out with new codexes, and the indexes don't have much flavor. It's understandable since they were pretty cramped for space (Orks, Tau, Tryanids and Genestealer Cults are all in one $20 book, for example). However, based on the current codices that have come out (Space Marines, Chaos Space Marines and Grey Knights) it looks like everyone will get their cool unique rules back when they get their books. So I'm pretty confident the orks will get back "Da red wunz go fasta!" The club I used to play at years ago had a rule that all models had to be at the very least primed. If people were new to the game or had just purchased the models they would cut them a lot of slack. As long as a person was making progress towards painting their stuff they could keep playing. The store I play at now doesn't have any painting requirements (that seems like it would be bad for business) but most people have at least some paint on their models. I try to have most of mine at least base coated, but the Trukk I took last time was still bare plastic and nobody gave me a hard time. I've heard about some clubs having a "Preferred Enemy: Unpainted Models" house rule where painted models got a bonus to hit unpainted ones. I guess it's pretty common for tournaments to have a three-color minimum for models, but I've never competed in a tournament.